Bookmarks allow to quickly jump to a certain position in the current document or add a link to this location within the document. Note: the bookmark name should begin wish a letter, but it can also contain numbers. The bookmark name cannot contain spaces, but can include the underscore character "_". check the Hidden bookmarks option to display hidden bookmarks in the list (i.e. the bookmarks automatically created by the program when adding references to a certain part of the document. For example, if you create a hyperlink to a certain heading within the document, the document editor automatically creates a hidden bookmark to the target of this link). click the Close button to close the window. To delete a bookmark select it in the bookmark list and use the Delete button. 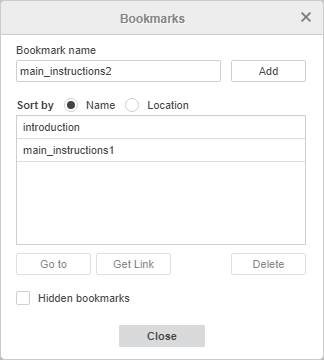 To find out how to use bookmarks when creating links please refer to the Add hyperlinks section.